The module Invoices provides an option of transforming a paper invoice into its digital form. 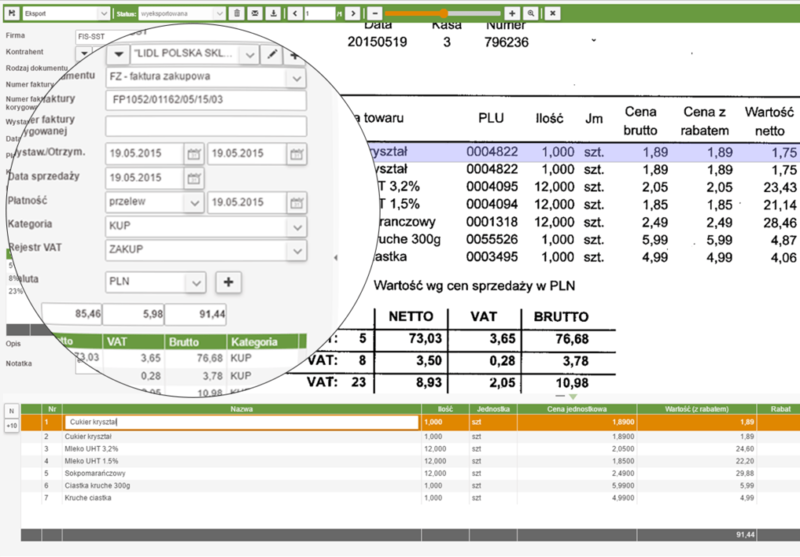 The embedded OCR engine and original content recognition algorithms complete the data necessary in the accounting system, where the documents are entered in the books. The system recognizes heading data and items in documents. The embedded knowledge base enables to increase the degree of document recognizability even to the correctness of 97%, which translates into the speed of entering invoices and enables to save time when entering accounting documents to the financial and accounting system. The system learns the document by dragging it. Next time it will recognize it even better. Integration with any financial and accounting / ERP systems enables to automatically export the data obtained from the paper invoice to your system. The system recognizes heading data of added invoices and their items. It has extended algorithms which verify the correctness of the data read (e.g. verification of the amounts, dates, discounts), thanks to which the system watches over the correctness of the recognized data before they are exported to the financial and accounting system. The embedded knowledge base learns the entered documents, thanks to which the level of document recognizability reaches 90%. In combination with the teaching module, recognizability reaches 97% for all documents. Our original solution enables the system user to interfere with the quality of recognition. By three integrated learning modules we offer you the option to teach the system the exact location in the document of specific data to be used by the system to complete the form. The system has been also designed also thinking about international companies with invoices issued in many countries and entered in the books in one accounting centre or separately. The OCR engine gives us an option to recognize invoices in many languages. According to the Polish law invoices should be archived for 5 years. UNISONO Flow provides an option to define the storage of your invoices for as long as necessary. The archive is not just the option to store invoices. It also stands for quick searching for and displaying of the image of an invoice straight from the accounting system by an additional customer’s application. We can also grant access to the archive to other interested parties, e.g. customers or tax control services so as to save time devoted to searching for documents in binders. In combination with the Tasks module, you can define the process of approval of documents entered in UNISONO Flow. One-stage and multistage approval is not a problem. The system is open to the customers’ requirements and it is able to adjust to processes in force in an individual company. The invoice module enables to automatically upload from the customer’s system the data necessary to enter documents in the books (companies, contractors, categories, VAT registers, etc.) and to export ready processed data to the customer’s financial and accounting / ERP systems, which in practice shortens the processing time of an individual document (the options may differ depending on the financial and accounting / ERP systems). UNISONO Flow frees the accountant from the laborious, absorbing, manual process of entering invoices. Specialists can focus on more creative tasks. They can retrieve the image of a specific invoice directly from the accounting software they use.